The SPH10-10 is a Bluetooth 3.0 Stereo headset with long-range Bluetooth intercom designed specifically for outdoor sports activities. With the SPH10, you can call handsfree on your Bluetooth mobile phone, listen to stereo music or voice instructions of GPS navigations by Bluetooth wirelessly, and have intercom conversations in full duplex with your companions. Thanks to the latest Bluetooth 3.0 and the advanced digital processing technology, the SPH10 offers the best sound quality for both incoming and outgoing sound in its class. Also, the easy-to-access and intuitive button operations make the SPH10-10 a perfect companion for outdoor sports. SPH10-10 can wirelessly connect to other Bluetooth devices supporting HSP/HFP (Headset Profile/Hands Free Profile) and A2DP (Advance Audio Distribution Profile). HSP/HFP is standard in all phones with Bluetooth features. Almost all Bluetooth MP3 players, smartphone, and audio dongles support A2DP to send stereo audio to Bluetooth headsets like the Sena SPH10-10. Enjoy Bluetooth music playback control by AVRCP: play, pause, track forward and track back. Other Bluetooth features include Multi-Pair to allow intercom functionality for 4 persons, up to 980 yards of wireless range, and more. You can easily decrease/increase the volume of the voice, music and intercom using Jog Dial. The SPH10-10 can save volume levels of previously connected profiles. This means that phone volume (HSP/HFP), music volume (A2DP), and intercom volumes will be saved separately and return to its own saved volume level whenever associated profile is reconnected. The SPH10-10 offers a secure and comfortable fit on the ears for use in outdoor sports. 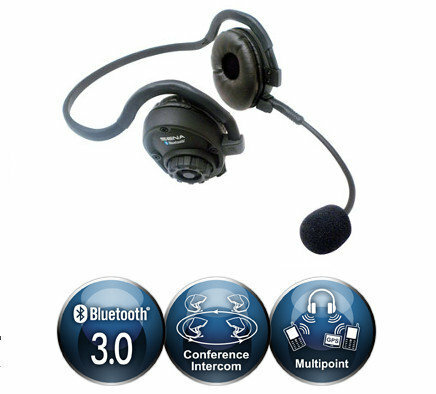 The headset is very durable, as well as sweat and water resistant, making it reliable for a long life of use in active conditions. Use the SPH10 during your next golf game, your next hunt or hike, or during any sport where you need to keep in touch with your teammates. The SPH10-10 offers peace of mind in your purchase with a 2-year warranty against workmanship defects. See the warranty card in your product packaging for full details. 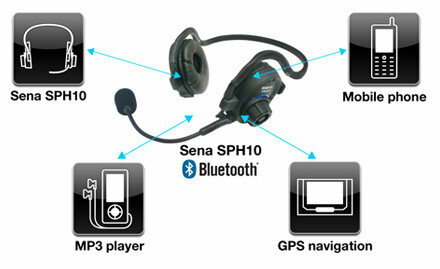 Sena SPH10-10 Bluetooth Headset, boom microphone, mini microphone, USB power and data cable, stereo audio cable, rubber earpads, manual, warranty.